Today I had a day off. Today I made snickers, sort of. Ohmyholycrap they are good. They basically consist of a peanut butter nougat, caramel, and peanuts. But uhhh…I didn’t have any peanuts. So I may or may not have used pecans? And it’s delicious? Even with the peanut butter nougat? Yes. Yes it is. I am happy. I saw the recipe on chow a while ago and bookmarked it. I’m glad I finally got around to making it. I have no regrets. I’m going to copy-paste here, because I am kind of in a hurry. Make these! They are wonderful. I made them with 58% couverture but I think that it’s a bit too much for the light flavour of the candy. I would definitely stick with the milk chocolate. Then again, I prefer milk chocolate over darker chocolates…so what do I know!? Make it with what you want! White chocolate however would be way way way too sweet and your teeth would shatter on first bite. Don’t do that. 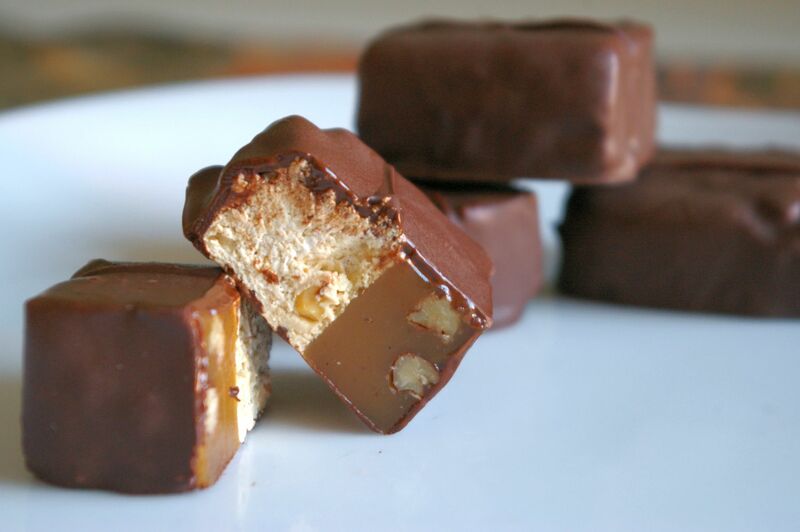 This entry was posted in Candy, Delicious things I think are pretty delicious and tagged candy bar, caramel, chocolate bar, delicious, peanut butter nougat, snickers. Bookmark the permalink.